Your garage is one of the main entrance points into your home. If your garage is not secured adequately, you could be leaving the belongings in your garage and home vulnerable to theft. Properly securing your garage starts with having a good garage door installed. If your Indianapolis home is in need of a garage door, call the professionals here at Garage Door Doctor. We can help with repairs, maintenance, or garage door installations. If you’d like to ensure that your garage is properly protected against break-ins and theft, keep reading for the steps you should take. If your garage door opener is broken and you’ve been manually opening and closing your garage door, not only are you putting the belongings in your garage and home at risk for theft, but you are also putting yourself in harm’s way. Garage doors are heavy and should not be lifted on a regular basis. If your garage door opener is broken, it’s important to call a garage door expert to either repair or replace your garage door opener. While garage door remotes are convenient, if they fall into the wrong hands, they are also potentially dangerous. Instead of using a remote that you clip to the sun visor in your car, consider getting a keychain remote to open and close your garage door, so there will be less of a chance that you will misplace your remote. This may seem obvious, but simply remembering to close your garage door will help a great deal in preventing theft. Even if it’s the middle of the day and you don’t see any harm in leaving your garage door open when you’re in your home, you never know who could be walking by and decide that they’d like to sneak in quickly to steal something. By this, we mean the door that may be going from your garage to your backyard or the door from your garage into your home. You may not think that someone would be willing to go through your backyard to get to the door that leads to your garage, but you could be wrong. And if someone does happen to get into your garage, that’s as far as you’d like them to go, we’re sure, so always lock the door from your garage into your home. If your garage has windows, don’t leave these windows uncovered. Invest in blinds for your garage windows in order to keep unwanted eyes from seeing the items you store in your garage. 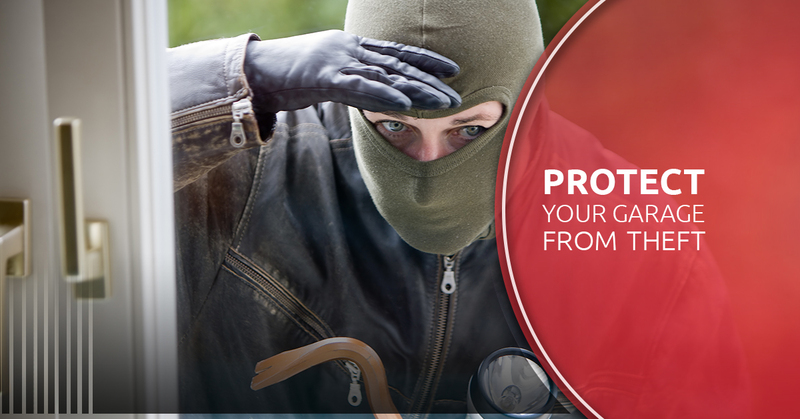 A thief might not think twice about breaking a window to get into a garage. If your garage door or garage door opener is in need of repairs in order to ensure the security of your garage and your home, call the garage door experts here at Garage Door Doctor in Indianapolis. We’d be happy to help you with any of your garage door needs.